EOS Price Analysis: Will the Bulls Push EOS/USD Towards $2.56 to Continue Higher? Support moving forward: $2.24, $2.15, $2.02, $2.00, $1.90, $1.74. Resistance moving forward: $2.56, $2.87, $2.99, $3.17, $3.19, $3.68. EOS has seen a price decline totaling 4.49% over the past 7 trading days and a further price fall totaling 10.81% over the past 30 trading days. This now brings the trading price down to around $2.35, at the time of writing. EOS is now ranked in 5th position as it currently holds a $2.12 billion market cap valuation. The cryptocurrency has seen a further 56% price plummet over the past 90 trading days as the 19-month old project now trades at a value that is 89% lower than the all-time high price. 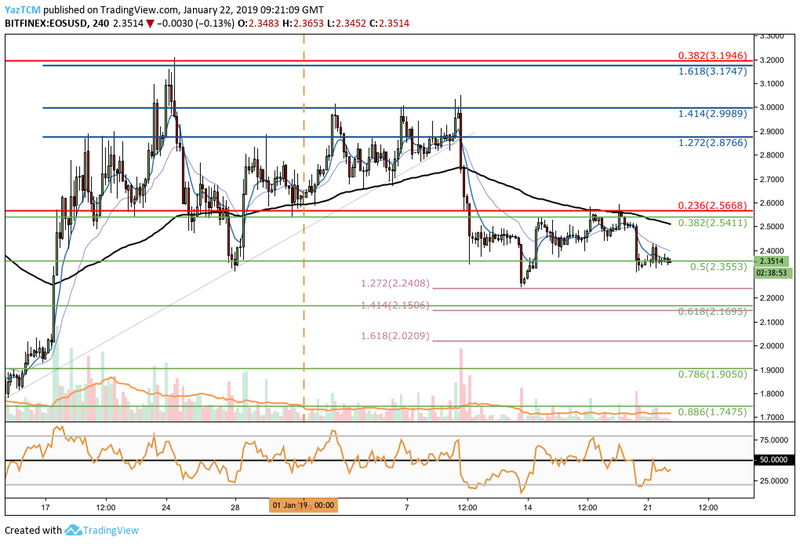 Analyzing the market from the 4-hour perspective above, we can see that since our last EOS/USD analysis, the market has rebounded from the support at the short-term 1.272 Fibonacci Extension level (drawn in lilac) priced at $2.24. EOS/USD continued to climb for the following few days but met resistance at the bearish .236 Fibonacci Retracement level (drawn in red) priced at $2.56. The market then reversed at this resistance and fell until it reached support recently at the short-term .5 Fibonacci Retracement level (drawn in green) priced at $2.35. The current trading trend is neutral as price action trades within the confines of the previous swing leg. For this market to be considered bearish, we would need to see price action break below the $2.24 handle. For this market to be considered bullish, we would need to see price action break above the $2.56 handle. Where is the Support Below the Current Market Trading Price? If price for EOS/USD breaks below the current support level at the short-term .5 Fibonacci Retracement level, we can expect immediate support towards the downside at the downside 1.272 Fibonacci Extension level (drawn in lilac) priced at $2.24. If the market breaks below this support, further support can be located at the short-term .618 Fibonacci Retracement level (drawn in green) priced at $2.16. There is even more support at the downside 1.618 Fibonacci Extension level (drawn in lilac) priced at $2.02. If the sellers push price action below the $2.00 handle, more support beneath can be expected at the short-term .786 and .886 Fibonacci Retracement levels (drawn in green) priced at $1.90 and $1.74, respectively. If EOS/USD rises above the support at the $2.35, immediate resistance towards the upside is located at the bearish .236 Fibonacci Retracement level (drawn in red) priced at $2.56. Further resistance above this level can be found at the short-term 1.272 and 1.414 Fibonacci Extension levels (drawn in blue) priced at $2.87 and $2.99, respectively. If the buyers can then cause EOS/USD to break above the $3.00 handle, we can expect more resistance at the short-term 1.618 Fibonacci Extension level (drawn in blue) priced at $3.17. This resistance is further reinforced by the bearish .382 Fibonacci Retracement level (drawn in red) priced at $3.19. 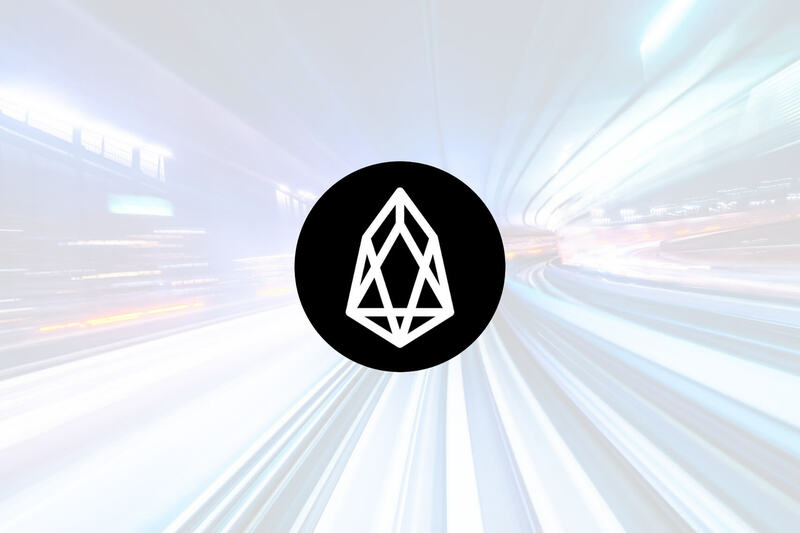 Analyzing EOS/BTC from the daily chart above, we can see that during November and December 2018 the market had experienced a considerable price decline. Price action slipped from a high above 90,000 SATS to a low of 47,151 SATS on December 7, 2018. After rebounding from this low in December 2018, the market went on to surge by a total of 60%. The bullish price run then met resistance at the bearish .618 Fibonacci Retracement level (drawn in red) priced at 73,116 SATS. This bearish Fibonacci Retracement level is measured from the high seen in November 2018 to the low seen in December 2018. 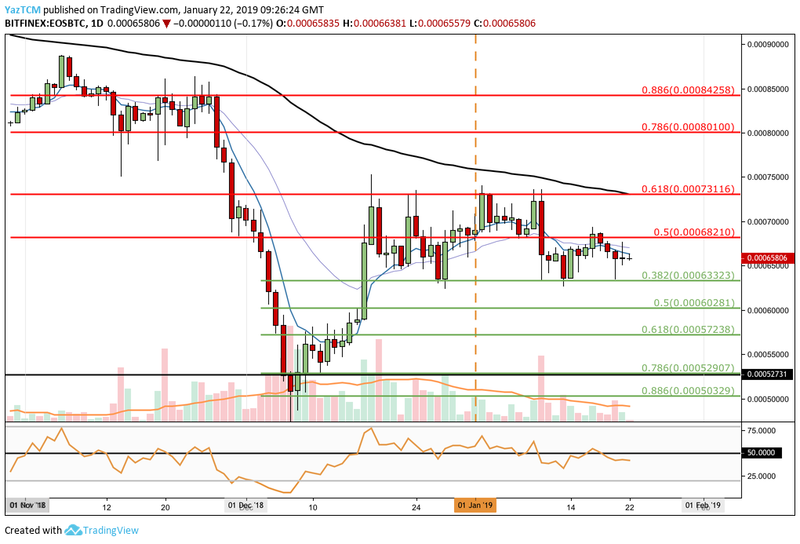 Price action went on to fall from the resistance into support at the short-term .382 Fibonacci Retracement level (drawn in green) priced at 63,323 SATS. The EOS/BTC market has now established a trading range between the 73,116 SATS handle and the 63,323 SATS handle. A break above the trading range would signal bullish momentum. For this market to be considered bearish, we would need to see a break below the current trading range. Where is the Support Located Below the Current Trading Range? If the EOS/BTC market breaks below the 63,000 SATS handle, we can expect further support towards the downside at the short-term .5 and .618 Fibonacci Retracement levels (drawn in green), priced at 60,281 SATS and 57,238 SATS respectively. If the sellers continue to drive the EOS/BTC market below the 55,000 SATS handle, more support towards the downside can be located at the short0term .786 and .886 Fibonacci Retracement levels (drawn in green), priced at 52,907 SATS and 50,239 SATS respectively. Alternatively, if the bulls begin to push price action higher, we can expect immediate resistance above at the bearish .5 Fibonacci Retracement level (drawn in red) priced at 68,210 SATS. There is more resistance at the upper boundary of the trading range priced at 73,116 SATS. If the buyers can begin to push EOS/BTC above the current trading range, we can find higher resistance at the bearish .786 and .886 Fibonacci Retracement levels (drawn in red), priced at 80,100 SATS and 84,258 SATS respectively. The recent price decline in BTC/USD has put pressure on the entire cryptocurrency market, including EOS/USD. If the EOS/USD market breaks below the $2.24 handle, we can expect price action to head lower toward the $2.00 handle.